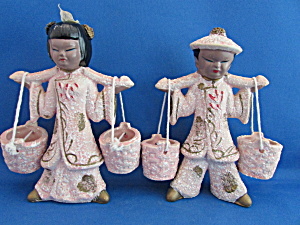 This wonderful set of Asian figurines holding water buckets is made out of chalkware. Both figurines are 6 1/2" tall. Male figurine is in excellent condition. Female does have some paint rubbed off of her hair and one of her buckets has a chip on the inside otherwise she is in excellent condition. These are very hard to find and fits the new retro-kitschy decor.